The solution is 1.g3 d5 2.Bg2 d4 3.Bc6+ Kd7 4.Sf3 d3 5.O-O dxe2 6.d3 exf1=R [+wRh1] 7.Sbd2 Rxg1 [+wKe1]+ 8.Sf1 Rxg3 [+wPg2] 9.Se3 e5 10.O-O. supports chaining multiple stipulations together. Jacobi can also solve some ordinary help stipulations but there is very little reason to do that because Jacobi is on average 5x slower than Popeye for this type of problem. In addition, Popeye and WinChloe support more stipulations, fairy conditions, and fairy pieces. One reason, though, would be for conditions exclusive to Jacobi. Jacobi can also solve orthodox proof games, but there is very little reason to do that because Jacobi should be slower than Natch or Euclide which are optimized for the orthodox case. It cannot solve stipulations containing defensive moves, like directmates or selfmate, which is why the subtitle calls it a "helpgame solver". As an exception, Jacobi will accept one defensive halfmove at the very end of the problem. See the separate documentation page. Find an example problem that interests you from the documentation page. Click on the corresponding "Load in solver" button. On the solver page, click "Start". Click on a solution to view it in the Game editor. Feel free to experiment by modifying the "Text representation" box, but keep in mind that each time you change something, you have to click on "Set problem from text" and then "Start". Just bookmark the latest version page so you can get to it directly. This page contains a WebWorker (and an AppCache manifest as fallback) which tells your browser to store every file needed by Jacobi on your computer/device so that the page still "loads" when offline in that particular browser. Some browsers even offer the option "Add to homescreen", which will turn Jacobi into a Web App that you can launch by clicking on an icon (as long as the browser remains installed and its application cache is not cleared). Zip archives of Jacobi are available. Updated irregularly. Here are the features I'm planning to add soon, so don't bother suggesting them! Jacobi will reach v1.0 when they are all implemented. Add a graphical editor for diagrams. Add an editor for stipulations with dropdown menus to select from available stipulations and aims. Add a graphical viewer for solutions. Add a few more aims (%, 00, ep). Add a few more fairy conditions (Chess960, FollowMyLeader, Duelist, Chameleon). Warn of self-check in the initial position instead of crashing. Teach the PG solver that doubled pawns imply a capture nearby when the fairy conditions are close to orthodox. Teach the PG solver that the path traversed by a pawn appearing in the goal diagram can't be vertically crossed in some cases when fairy conditions are close to orthodox. Rewrite the PG-demolition-mode code, hopefully making it faster. Add a WebAssembly version of the chess engine for a speed increase of maybe 50% in modern browsers, with fallback to asm.js for the rest. Jacobi is freeware, which means that you are free to use it and make a copy for personal use, but not to redistribute copies as I retain the Copyright on it. Here I keep links to future, current, and old versions. Old versions are useful to you if I break something with an update. Future versions are not recommended unless you want to test upcoming features. Fixed a bug in Circe Parrain Strict. Added the condition AntiCirce (with 18 variants). Got for free the condition KamikazeCirce = AntiCirce RexExclusive Relaxed + Circe. Added the condition Circe Super (SuperCirce). Added the condition Circe WaitMove (= Circe LastMove in Popeye). Moved the condition Circe Parrain to the bottom section because it is now implemented as Circe WaitMove Equipollents, following Popeye. Added the convenience condition IbidemCirce = Circe Symmetry Diametral. Added the condition Circe WaitCapture (defined in the documentation). Got for free the condition MemoryCirce = Circe WaitCapture Symmetry Diametral. Changed the behavior of Circe Parrain RexInclusive to be similar to MemoryCirce RexInclusive: A captured king in memory is not yet annihilated; it becomes annihilated only when its rebirth fails. Improved the speed of Circe RexInclusive, Koeko, Isardam and Leffie by about 2x for PGs, and 2.5x for non-PGs. Improved the speed of Andernach and AntiAndernach for PGs by 0% to 200% depending on the problem (about 20% on average). Improved the speed when generating thousands of solutions with the solver setting "Keep going" or "Count only". Changed a bit how constraints behave with fairy conditions, to accommodate AntiCirce. Warn of constraints that are impossible to achieve, for example Pa2-b3, or more insidiously Pa2-a8 (forgetting to specify the promotion). Before, Jacobi would often instantly finish without feedback, and sometimes crash. Unfortunately, there is a 5% slowdown for a few problems, caused by the big code change. Fixed a crash when a royal pawn can be taken en passant. Fixed a crash when solving KobulKings + Circe RexInclusive PGs. Fixed a bug in AntiParry: the rules when castling through check were not correctly implemented. In the text input, allow the "royal" attribute when declaring pieces (same notation as Popeye). Improved the calculation of king moves in Circe PGs without RexInclusive. Improved the solving speed of non-PGs by about 6%. Heuristic mode: Improved speed by about 60%. Game editor: For mouse-based devices, changed the cursor to a hand when hovering over a piece which has a legal move. Game editor: Unusual royal pieces are now marked with a red cross. Fixed a bug in Circe Couscous Diagram. Fixed a crash in Kk + Koeko. Series dia stipulations now always start with White (by default), to correspond to Popeye and PDB. For example, ser-hdia now starts with White, even though it starts with Black if the aim is different (mate, stalemate, ...). Added the condition LeseMajeste, to allow illegal starting positions where the player to move is already checking the opponent's king. Added the condition ReleasingCheck, which modifies the play-after-mate conditions (#R, #C, Kk) to authorize a temporary self-check. Added a "Heuristic mode" to limit the search to solutions that are locally dual-free. See the documentation. Added a section Series stipulations to the documentation. Constraints: Fixed a crash when using constraints under Circe Assassin or #R Chess. Game editor: Made the "Editable game notation" box more permissive in what it accepts. Game editor: Added markers to show legal moves. A marker is green if no local dual is detected, otherwise it is orange or red (depending on the type of dual). This is similar to iNatch. Added a game editor which is also a solution viewer. Try it or see the documentation. Introduced a new stipulation "u" to partially check some antagonistic problems. Improved the solving speed of forward stipulation problems by 0% to 200% depending on the problem (about 20% on average). Constraints: Give an error when an immobile piece is forced by a constraint to move. Improved the accuracy of the progress percentage for some PGs. Fixed a bug introduced in v0.5.1 causing missing en-passant moves in Immun. Fixed a bug in Isardam + Eiffel. Fixed a bug causing missing checks in Circe Strict + Isardam. Added the condition Isardam PawnExclusive. Added the condition Leffie (moves causing an Eiffel-like paralysis are illegal). Modified Circe Assassin + Koeko to correspond to Popeye (no contact if the piece suicided). Modified OscillatingKings + Koeko to correspond to Popeye (look for contact after king swap). Constraints: Fixed a crash when solving series stipulations. Constraints: Slightly improved the performance of "x" and "*". Constraints: The number of moves played by a piece can now be a range instead of a minimum. Fixed a crash with GrowingMen + Circe RexInclusive. Fixed a crash when solving Circe Clone + SwappingKings PGs. Fixed a crash when solving Einstein + Circe ContraParrain PGs. Fixed a crash when solving Relegation PGs. Fixed a crash when solving OscillatingKings + Sentinels PGs. Added the convenience condition CirceDoubleAgents = Circe Turncoats Mirror. Added the convenience condition HorizontalSymmetryCirce = Circe Symmetry VerticalMirror. Added the convenience condition VerticalSymmetryCirce = Circe Symmetry Diametral VerticalMirror. Added the command "constraints", described in the documentation. Moved old versions behind a Show/Hide button for a leaner welcome page. In AntiParry, allow starting positions where the side to play can capture the king. They were erroneously blocked. Improved the dialog error box. The old dialog sometimes had the prefix "wismuth.com says" or a checkbox labeled "Prevent this page from creating additional dialogs". In All-in Chess, forbid castling with the opponent's pieces if the mover's king is in check. Added the condition Duelist (also known as Single Combat). Added some material to the documentation. Switched to https for the link to the latest version, which seems to work better for offline. Fixed a crash with FaceToFace + BackHome. Fixed a crash when solving OscillatingKings PGs. Added the condition Madrasi PawnExclusive. Modified the condition NoImmediateRepetition to compare only the diagrams, not the positions, so that AllInChess + GrowingMen works as expected. Fixed the stipulation parser to accept HS# written in uppercase. It stopped working in v0.2.3. Moved the documentation to a separate page, added some material. Added "Load in solver" buttons next to examples. Added a menu button in the top-left corner of the solver to access the documentation from there, available offline. Fixed a crash when solving OscillatingKings + Circe PGs. Improved the performance of the PG option "Add" for some problems. Theoretically improved the solving speed of PGs with Bicapture, Cannibal, and Circe Assassin. Improved PG demolition mode performance for #R Chess. Fixed page load error on iOS after adding to homescreen. Accept and ignore the command "protocol" instead of complaining. Reject repeated or misplaced "forsyth" and "pieces" commands, to prevent misunderstandings. Report errors caused by bad inputs in a pop-up dialog instead of the crash box. Changed the application order of Masand, OscillatingKings, #R Chess, #C Chess, and Kk Chess. Fixed a crash with #C Chess and Bicapture. Fixed a crash with Kk Chess and Circe variants where a rebirth can promote. Added the PG option "Add" to add specific pieces. See the example in the "Special proof games" section above. See the documentation. Fixed a crash with Knightmate. Added the condition #R Chess. 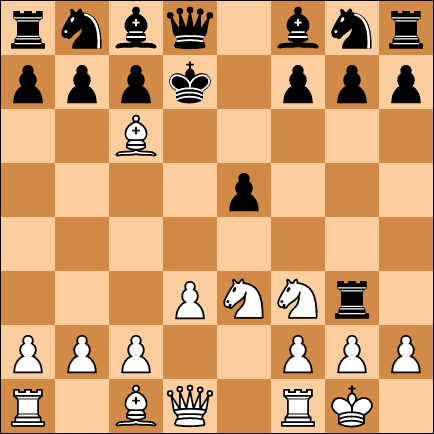 Added the condition #C Chess. Added the condition Kk Chess. These were introduced in feenschach 212 (2015). Definitions are also given in Quartz 44 (2017). Added the condition SwappingKings (implemented as WhiteOscillatingKings TypeC + BlackOscillatingKings TypeC). Accidentally improved the speed of Circe RexInclusive. Fixed a bug introduced in v0.4.4 causing some rare crashes when solving PGs. Fixed a crash with Chess960 + RoyalDynasty. Added the condition BlackCap (implemented as BlackMustCapture SemiUltra + BlackPassesIfStuck). Added the condition BlackChecks (implemented as BlackMustCheck SemiUltra + BlackPassesIfStuck). The text box also accepts the alternative name "Checking". Added the condition Zigzag (implemented as WhiteMustCapture Anti SemiUltra + WhiteMustCheck Anti SemiUltra) and the variants ZigzagStapff and ZigzagUltra. Fixed a crash with PromOnly P and Circe variants where a rebirth can promote. Fixed a crash with AdversePromotions + Tibet. Fixed a crash with RoyalDynasty + KobulKings. Changed the behavior of PromOnly + ChameleonChess to correspond to Popeye. Fixed a display bug introduced in v0.4.4 that produced strange notation for RelegationChess and ChameleonChess. Improved the solving speed of PGs by about 10%. Improved the solving speed of some series PGs. Fixed degraded performance for PGs with two rooks of the same color ending on files d and f.
Fixed e.p. notation in output language "French-çé". Removed the warning "Keep this window visible when solving...", except for Safari. For other browsers it seems this is not an issue since v0.2. Improved the solving speed of some PGs with doubled pawns some more. Invisible promotions (Phoenix, Prenix and Ceriani-Frolkin) can now sometimes be deduced. Fixed a crash with Madrasi. Fixed a crash when solving Chess960 + VerticalCylinder PGs. Fixed a crash when solving Circe Parrain PGs in demolition mode. Fixed a bug causing a check by a pawn to be counted as a multiple check when the pawn would otherwise promote, in some fairy conditions. Fixed a bug introduced in v0.2.3 causing the stipulations s#1 and r#1 to no longer work. Fixed two bugs introduced in v0.4.2 that caused some crashes when solving PGs, and potentially caused missing solutions with LosingChess and Extinction. Fixed a bug that prevented the "test" command from applying to the initial position. This is useful for adding constraints to the initial position in Chess960. Replaced the "Flood protection" checkbox with a menu with a new option "Count only" which is more efficient for path enumeration problems with more than 1000 solutions. Improved the solving speed of some PGs with doubled pawns. For example, P1273714 improved 100000x. Allow PGs with more than 32 pieces on the diagram. This can happen when promoting pawns in Sentinels. Fixed a bug affecting ChameleonChess PGs. Fixed a performance bug affecting PGs with Berolina pawns. Fixed a crash when solving Chigorin + Einstein Reversal + AntiAndernach PGs. Fixed a crash in v0.4.1 when attempting to solve a PG with two kings and the option ColorThePieces. Renamed MoveAnyPiece to FreeForAll (Jed Stone, 1982). Fixed a crash when solving Circe Parrain Assassin PGs. Fixed a crash when solving AntiAndernach + NonRoyalKings PGs. Fixed a bug in EiffelChess (there was paralysis of fairy pieces). Fixed a bug in Woozles + White/BlackEdgemover. Fixed bugs in Masand when combined with Disparate, Circe Rexinclusive, NewKoeko, or Isardam. Changed the behavior of Sentinels + BackHome and Sentinels + Circe Diagram to correspond to Popeye and WinChloe. Sentinels no longer have an origin square. Improved the solving speed of Isardam by 3-12x for non-PGs, and 12x for PGs. Added the fairy piece Berolina pawn. Moved the condition Circe ContraParrain to the bottom section as Circe Parrain Mirror, following Popeye. Added the condition ChigorinChess (special starting position and promotions). Added the condition AlmostChess (special starting position and promotions). Added the condition Knightmate (special starting position and promotions). Added the condition BerolinaChess (special starting position). Added the condition Sentinels Berolina. Added the aims ++, +++, ... , ++++++++. The number of checks is now displayed in the solution, unless also mate. Made the PG solver a bit smarter and optimized the code. PG solving speed has improved by 2% to 60% depending on the problem, and a lot more for PWC and Sentinels. Fixed a crash with Bicapture + Multicapture. Fixed a crash with Masand. Fixed a crash with VerticalCylinder + Maximummer. Distance now takes into account the board topology. Fixed a crash with VerticalCylinder + BlackMustCapture Ultra. Fixed a crash when solving Tibet PGs. Fixed a crash when solving ChameleonChess PGs. Fixed a crash when solving KobulKings + Einstein PGs. Fixed a crash when solving FaceToFace + BackToBack PGs. Fixed a crash when solving Circe Turncoats + Masand PGs. Fixed a crash when solving Circe Turncoats RexInclusive PGs. Fixed a crash when solving Bicapture + Circe Couscous PGs. Fixed a crash with Tibet. The condition was unusable. Fixed a crash when chaining more than 5 PG stipulations. Moved the condition Bichromatic to the bottom section as "Monochromatic Anti", for technical reasons. Added the condition NormalPawn (which can be added to Annan, PWC and others to let a pawn on its first rank move). Added the condition Circe Strict. Added the condition Circe Assassin. Added the aims %, 00, and ep. Fixed a bug introduced in v0.3 causing demolition mode to crash with almost every condition. Fixed a crash with Circe Turncoats RexInclusive. Fixed a bug causing NoImmediateRepetition to wrongly accept some repetitions mid-game when solving PGs. Improved the solving speed of Vogtlaender by 6x (for non-PGs). Added extra checkboxes for conditions like LosingChess, to aid discoverability. Made the Text representation box understand condition names written in French or German. Fixed the figurine color when displaying AllInChess solutions. Added the condition UnicaptureChess (implemented as Multicapture Anti). Got for free the condition AntiNewKoeko. Added the condition ContactGridChess (implemented as Grid + Koeko AffectedByGrid AppliesToRebirth). Reordered the conditions to better reflect the order in which they are applied. For example (following Popeye), Monochromatic affects Madrasi paralysis and Madrasi paralysis affects the definition of observation of Patrol, so these three conditions are listed in the order Monochromatic, Madrasi, Patrol. Changed the behavior of Madrasi to correspond to Popeye: test for royal units instead of the king piece. Changed the behavior of Circe Clone to correspond to Popeye: test for royal units instead of the king piece (change detectable by adding KobulKings or LosingChess). Fixed a bug in Monochromatic + Madrasi causing some missing en-passant paralysis. Fixed some missing king moves in Monochromatic + FaceToFace. Correctly apply Monochromatic and Bichromatic to castling rook in Chess960. Fixed castling distance in Chess960 + Maximummer. Improved the solving speed of some Monochromatic and Bichromatic PGs. For example, P0008928 improved 250x. Warn if the side to play can capture the king (instead of crashing). Fixed a bug causing no solutions in Masand PGs when the goal diagram hides a king as an undefined piece without ColorThePieces. Fixed a crash when solving Masand PGs. Fixed a crash when solving Tacu enigmas with AntiAndernach. Added the condition Madrasi RexInclusive. Added the condition AllInChess (implemented as MoveAnyPieceFreeForAll + NoImmediateRepetition). Added the condition Isardam RexInclusive. Notate the starting file of a vertical pawn move if ambiguous (common in Annan). Generalized stipulation closure to any sequence of "h" and "*", with "s" or "r" allowed as the last character. This covers 8 of the 12 series genres listed in an article by Nicolas Dupont in issue 13 of the ChessProblems.ca Bulletin. Generalized reflex stipulations, with examples given in the new "Reflex stipulations" section above documentation. Fixed a bug affecting Hypervolage PGs. Fixed a bug affecting Einstein + VerticalCylinder PGs. Fixed a crash with Circe RexInclusive Chameleon + KobulKings. Fixed a crash with Extinction. Changed the behavior of Circe Chameleon + CavalierMajeur to correspond to Popeye. Fixed a crash in v0.2 and v0.2.1 when solving VerticalCylinder PGs. Notate extended castling O-O-O-O. Fixed a bug in v0.2.1 with Vogtlaender. In reflex series, reject solutions when the idle side can reach the aim during the series. With this change there is a unique solution to the ser-hr#8 by Meinking and Petkov, StrateGems 2011, reproduced on p.44 of Dan Meinking's Chess Problem Collection ("forsyth 1S6/pK1R4/3Bk3/r5P1/6P1/8/1PB5/8 stip ser-hr#7" in Jacobi). Temporarily hardcoded the version number in the "Launch the latest version" button until I resolve issues Firefox has with the auto-updating version. Bug fixes only. Most of the crashes were found by myself through automated testing. Fixed a crash when solving Circe Chameleon PGs. Fixed a crash when a rook able to castle comes from a rebirth promotion, for example the rebirth [+bPa1=wR] in PWC + Volage. Fixed a crash when a king is reborn in Circe Clone RexInclusive. Fixed a crash when a king is reborn in Circe RexInclusive + Hypervolage. Fixed a crash with Circe Parrain + Andernach. Fixed a crash with Volage + Einstein. Fixed a bug causing a complete lack of solutions when the initial position had a missing king in Circe RexInclusive. Fixed a crash in v0.2 when solving Tacu enigmas with Sentinels. Fixed a performance regression in v0.2 when solving Tacu enigmas with Circe or Annan. Fixed a crash with Circe Parrain + Annan. Fixed a bug causing stalemate notation (=) to appear mid-series after a parry move. Added the ability to specify the hash table size. Dramatically improved the performance when solving PGs with diagrams similar to the homebase position. Fixed a bug causing some castling solutions to be missing in PGs with Hypervolage and a few other conditions. See details. Update the explored variation on screen less often, and other small performance improvements. Fixed Disparate behavior in series. Can now solve JF-996. Many planned features have been postponed to get something out as fast as possible. For now, the problems can only be input in text representation, apart from conditions which can be set by clicking checkboxes.